Beneath the scorching Carribean sun, Hanz Hölzl's black jeep drives onto the main road, only to be noisily smashed off the street by a speeding bus. Thomas Roth's "Falco - Verdammt, wir leben noch" (translated: "Falco - dammit, we're still alive") begins and ends with Falco's fatal car crash. It's not a particularly original story arc being told here, but give it credit for a marginally new point of view: A waitress, played by Grace Jones (! ), retells the final hours of his life - on the parking lot in front of her bar. And that's where things really take off. 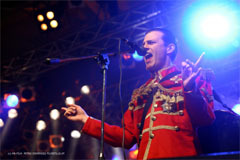 In chronological order, Hölzl's musical childhood and youth are shown, followed by his first performances with Austrian band Hallucination Company and shock rockers Drahdiwaberl. Next, we see the creation of the stage persona Falco, which eventually lands him the hit "Rock Me Amadeaus" and the top spot on the US Billboard charts. The movie attempts to show how Falco and Hölzl gradually become one and the same, and how the popstar tries to escape the mounting pressure to succeed, aided by cocaine, pills and lots of whiskey. The essence of it all is that behind the arrogant jerk there was a sensitive but complicated person, who in a very simple way was in search of support and love - a home, wife and kid(s). However, his relationship to Jacqueline (Patricia Aulitzky is playing Falco's lover, whose real-life name was Isabella) doesn't work out, and after eight years of standing in as "best dad in the world" Hölzl discovers to his detriment that their daughter isn't in fact his. So far, no revelations here. The movie is based on biographical facts, but the details are pure conjecture. In other words: The dialogues, scenes and other small matters such as his childhood friendship with the character Billy are completely made up. Which wouldn't actually be a bad thing if they had approached the matter with some ingenuity. But Falco's womanizing, drug escapades, ups and downs are reduced to unexpressive scenelets: The boy Hans standing in front of a brothel as a kid, then the man Falco doing the same - we get it, he didn't object to prostitutes. But does one really have to be that blaringly obvious about it? Dialogues come across as laboured and clumsy, for instance when Hans' Mom says: "See? Practicing really payed off". 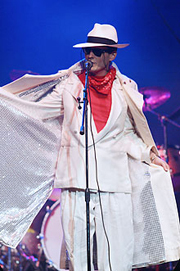 Particularly underwhelming are the "in concert" scenes, which are musically sound (leading man Rubey sings everything himself, and the filmmakers cooperated with Falco's original producers Rob and Ferdi Bolland to rerecord all songs), but more reminiscent of a Karaoke performance than an actual rock concert. Considering they had a budget of 4 million Euros, this seems somewhat disappointing. But if you manage to lower your expectations, the cast could set you up for a nice surprise along with the soundtrack. One could have done a lot worse in selecting someone to play Falco. Manuel Rubey does a good job - especially if you consider that he's an acting novice (aside from roles in the TV series "Tatort" and "SOKO Kitzbühel"). He's way better known to Ö3 (note: Austrian pop radio) listeners as the frontman of the band Mondscheiner. One can tell that he spent a lot of time in front of a mirror to portray The Falcon as authentically arrogant as he possibly could. But of course, there is only one Falco, and the makeup department could have tried a little harder to turn the young, boyish Rubey into a 40 year old human trainwreck ... On the other hand, neither Robert Stadlober, who didn't think he was up to the role, or - much worse - Manuel Ortega would have been right for the part. * "This ain't awesome, but crappy"
*** "He's pretty awesome - but the imitation can never outdo the original"